Life is hardly rosy for newlyweds after exchanging those vows, rushing off on a dreamy honeymoon, and coming back to real life. Reality is always hard, and newlyweds are now faced with a large number of challenges, the chief of which is creating a financial plan. 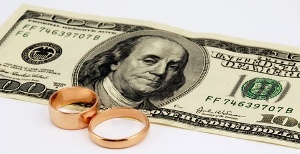 They can no longer create a financial plan on their own; they need to do it with their spouses; and this is where a large number of newlyweds accept defeat and admit that they simply cannot figure out how they can put together a financial plan. Fortunately for newlyweds, there are innumerable online and offline resources, books, and software enabling them to create a budget for the first time as a married couple. If you feel that your financial situation is a bit messy, you might like to hire the services of a financial planner. Both of you must invest some time sitting together and honestly discussing the state of your individual finances, and this includes the debts you might as incurred as individuals prior to your marriage. Discuss debts, credit scores, income, and expenditure. Once things are clearer, each partner can vow to handle individual debts on his/her own while sharing household debts and expenses. If you enjoyed going on shopping sprees in your single days, this might disappoint you a bit. You must now remember that you are a small family and that the expenses of one will have a huge impact on the other. Shopping together will work wonders not only for your budget, but also for your relationship. When you are creating a family budget with your spouse, set some spending rules and stick to them. For instance, one of your spending rules might require you to talk to your spouse before making large purchases. Initially, you might find this a bit difficult; but if you stick to it, you will soon realize the joys of combined finances and shared financial duties. The fact that you no longer have to share the financial burden alone is a blessing in itself. Let one of the partners pay household bills and make household purchases and keep the other informed about it. You should set financial goals as partners with the objective of clearing off individual as well as family debts, building family wealth, creating funds for the kids’ education, investing money, saving money, and so on. You might for instance dream of going on annual vacations, create a fund on which to retire comfortably, or build a nice little cottage in the suburbs. You must set these goals and work toward them as a team. Holding regular financial meetings and honestly discussing purchases, debts, investment, and savings will make you financially stable as a couple. Simultaneously, you could also read some nice family budgeting books such as “Smart Couples Finish Rich,” by David Bach or visit good financial advice sites. It is also a nice idea to change wills and update insurance plans.